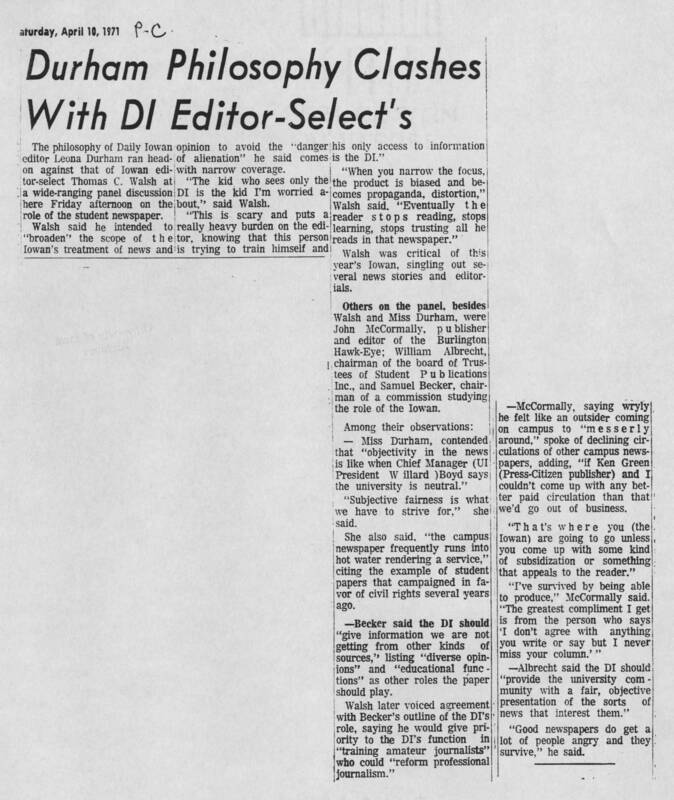 DIY History | Transcribe | Social Justice | Daily Iowan and Leona Durham controversy, 1970-1972 | 1971-04-10 Iowa City Press-Citizen Article: "Durham Philosophy Clashes With DI Editor-Select's"
1971-04-10 Iowa City Press-Citizen Article: "Durham Philosophy Clashes With DI Editor-Select's"
Saturday, April 10 1971 P-C Durham Philosophy Clashes With DI Editor-Select's The philosophy of Daily Iowan editor Leona Durham ran head on against that of Iowan editor-select Thomas C. Walsh at a wide-ranging panel discussion here Friday afternoon on the role of the student newspaper. Walsh said he intended to "broaden" the scope of the Iowan's treatment of news and opinion to avoid the "danger of alienation" he said comes with narrow coverage. "The kid who sees only the DI is the kid I'm worried about," said Walsh. "This is scary and puts a really heavy burden on the editor, knowing that this person is trying to train himself and his only access to information is the DI." "When you narrow the focus the product is biased and becomes propaganda distortion," Walsh said. "Eventually the reader stops reading, stops learning, stops trusting all he reads in that newspaper." Walsh was critical of this year's Iowan singling out several news stories and editorials. Others on the panel, besides Walsh and Miss Durham, were John McCormally, publisher and editor of the Burlington Hawk-Eye; William Albrecht, chairman of the board of Trustees of Student Publications, Inc., and Samuel Becker, chairman of a commission studying the role of the Iowan. Among their observations: - Miss Durham contended that "objectivity in the news is like when Chief Manager (UI President Willard) Boyd says the university is neutral." "Subjective fairness is what we have to strive for," she said. She also said, "The campus newspaper frequently runs into hot water rendering a service," citing the example of student papers that campaigned in favor of civil rights several years ago. - Becker said the Di should "give information we are not getting from other kinds of sources," listing "diverse opinions" and "educational functions" as other roles the paper should play. Walsh later voiced agreement with Becker's outline of the DI's role, saying he would give priority to the DI's function in "training amateur journalists" who could "reform professional journalism." -McCormally, staying wryly he felt like an outsider coming on campus to "messerly around," spoke of declining circulations of other campus newspapers, adding "if Ken Green (Press-Citizen publisher) and I couldn't come up with any better paid circulation that that we'd go out of business. "That's where you (the Iowan) are going to go unless you come up with some kind of subsidization or something that appeals to the reader." "I've survived by being able to produce." McCormally said. "The greatest compliment I get is from the person who says 'I don't agree with anything you writer or say but I never miss your column. ;" - Albrecht said the DI should "provide the university community with a fair, objective presentation of the sorts of news that interest them." "Good newspapers do get a lot of people angry and they survive," he said.